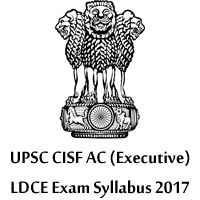 UPSC CISF Syllabus 2019 is updated. We are providing UPSC CISF AC syllabus for Limited Departmental Competitive Examination. You can download quickly from the direct link provided below. You can also view the Union Public Service Commission exam pattern in the following sections of the page. Applicants successfully registered for the LDCE Assistant Commandant exam and now searching for the UPSC syllabus 2019. If you are searching for the UPSC CISF Syllabus, then you are at the right place because we provided all the Assistant Commandant Exam syllabus in detail. Many candidates are facing problems while preparing for the UPSC AC ( Executive) exam. You know that syllabus plays a crucial role while preparing for any exam. To help in the Limited Departmental Competitive Examination, we are giving the UPSC AC syllabus 2019. We are also giving UPSC exam pattern along with UPSC CISF syllabus in the below sections. First of all, to prepare for Assistant Commandant Exam you should know the UPSC CISF AC Exam Pattern. Once you have knowledge about the UPSC Central Industrial Security Force Exam Pattern, then go to the syllabus section. You should prepare for the UPSC Exam 2019 according to the weightage of the marks. You should give more importance to the topics having more weightage so that you can easily qualify for the Union Public Service Commission Assistant Commandant Exam. So, all the candidates who want to start their career with UPSC Central Industrial Security Force as an Assistant Commandant can check the UPSC CISF Syllabus below. Everyone know that syllabus is important to prepare for the exam. So, before starting your preparation see the below UPSC CISF Syllabus. We are giving the UPSC Exam pattern along with topic wise syllabus in detail. LDCE is one the difficult exam conducted by the UPSC every year. By following all the UPSC Assistant Commandant syllabus and test pattern, you can easily crack this exam. Recently, UPSC Central Industrial security force released Assistant Commandant exam notification to fill the seven vacancies. So, all the willing candidates who want to start their career in UPSC CISF as Executive (AC) 2019 can check the details. Many people applied for the UPSC AC (Executive) Exam. If you did not register till now grab this opportunity and apply on or before the last date. In this section, we are giving the UPSC Test Pattern. So, all the applicants can start their preparation because we gave detail information about the UPSC Assistant Commandant Exam Pattern. This UPSC CISF AC LDCE Question Paper will be of Objective Type. This exam is a written Test Multiple Choice Questions will be set in English as well as Hindi. UPSC CISF Executive (AC) Question Paper – 1 comprises of two papers, each of 150 Marks. We are providing all the syllabus in detail on our website. You can easily crack this exam by following the syllabus here. You can easily download it for free.We are providing here in pdf format for easy download. It takes only a few seconds for you to download on our website. Paper I: General Ability and Intelligence and Professional Skill. UPSC CISF Assistant Commandant section will be designed to test the professional skills of the applicants about operational as well as the administrative requirement of the Central Industrial Security Force (CISF). CISF AC (Executive) will be covering the following topics. The UPSC CISF AC Syllabus and Exam Pattern will help you to prepare well for the Limited Departmental Competitive Examination. So, all the candidates can download quickly from this website. You can start your preparation now for the UPSC LDCE Exam. All the Best for all the candidates appearing for the Examination.